Much as we'd like it to be different, grief and the grieving heart do not take a break when you go to work. Someone grieving a loss still has to keep on going even when the world may be falling apart. People can experience personal and professional losses for a variety of different reasons ranging from the death of a loved one, the break-up of a relationship, the diagnosis of a life-threatening disease to the loss of a job and other more private losses like experiencing a miscarriage. Understandably, grief, the response to these losses, can and most often does follow employees and employers alike into the workplace affecting people's work performance on several different levels. One of the biggest issues I faced was I had to show up for work and maintain social appearances while inside my heart had stopped beating. Find out more about what you can do to help yourself and to help others when grief enters the workplace. 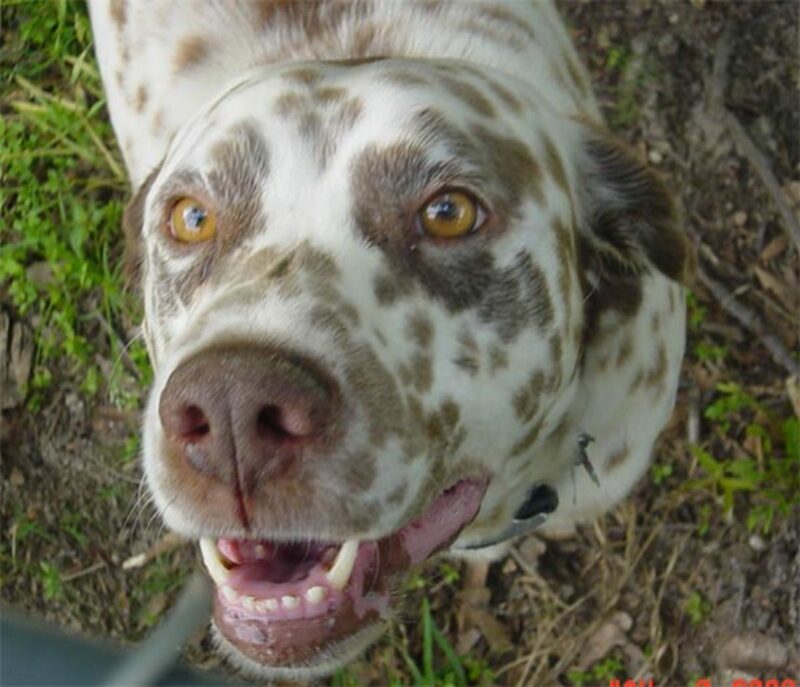 Image: Pipp. Modified from Notebook. Royalty Free Use. According to research results released by the Grief Recovery Institute in 2003, the grief caused by the death of loved ones or a close friend, divorce, family crises, financial losses, pet losses and other major life events cost U.S. businesses more than $75.1 billion. Now, six years later in 2009, with the current state of loss in the economy one can imagine that the cost of grief and grieving losses in the workplace would be in excess of $80.0 billion or more. In addition care giving responsibilities impact workplace employees. A 2006 study conducted by the National Alliance for Caregiving and MetLife found that United States businesses lose approximately $17.1 billion to $33.6 billion per year in productivity for full-time employees that have care giving responsibilities whether caring for aging parents or an ailing spouse or child. Caregivers experience a number of different types of grief. Source: The Grief Recovery Institute and National Alliance for Caregiving. Image Source: Martin Carter. Poppy flower leaves. Royalty Free Use. My article on Dealing with Loss & Grief in the Workplace was reprinted as a resource for the LiveandWorkWell* resource for provided as a member benefit by the United Behavioral Health. Since then it has been reproduced and reused in several other locations. * LiveandWorkWell provides people with confidential resources for mental health and life's changes. An article on Dealing with Death & Grief in the Workplace from the Employees perspective from Journey of Hearts. An article on Dealing with Death & Grief in the Workplace from the Employers perspective from Journey of Hearts. The version focusing on Employees was given as part of a lecture, presentation given for the California Maritime Academy. This article has been reprinted in several different locations. The version focusing on Employers was given as part of a lecture, presentation given for the California Maritime Academy. This version of Dealing with Death & Grief in the Workplace has been reprinted as a resource by the University of Houston-Downtown as an hr (Human Resource or ESO (Employment Services and Operations) employee resource. A copy of my article published in the March 2008 issue of The Bereavement Buddy, a resource from the National Centre for Loss & Grief, (NALAG). Another resource from Dr. Dyer, the Workplace Grief website contains information to help employees, co-workers and managers better understand the normal grief response along with resources for helping those grieving a loss. Grief and loss do not disappear when we enter the workplace causing a grieving person to impact the workplace in different ways. Healthy Profits: The 5 Elements of Strategic Wellness in the Workplace the book is now available through the Health Profits website. Dr. Kirsti A. Dyer has contributed the chapter on Grief in the Workplace entitled "Loss and the Workplace: What to Do at Work When the World Crashes in Around You." Dr. Dyer, a.k.a. 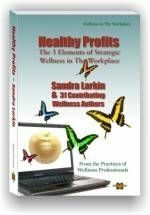 Comfortdoc, is one of 32 authors who have contributed to the 200 page Healthy Profits book. Healthy Profits, the Book was written to be a resource for people and businesses who are already working to address the problems and create healthier and more productive workplaces. Healthy Profits: The 5 Elements of Strategic Wellness is available through the Health Profits Health Profits website for $22.50 including shipping and will soon be available on Amazon. A series of articles focusing on grief in the workplace that I am writing on Suite 101. Grief does not stay quietly at home. Grief follows people to work. Grieving employees or employers can have a financial, emotional, social and physical impact on work. 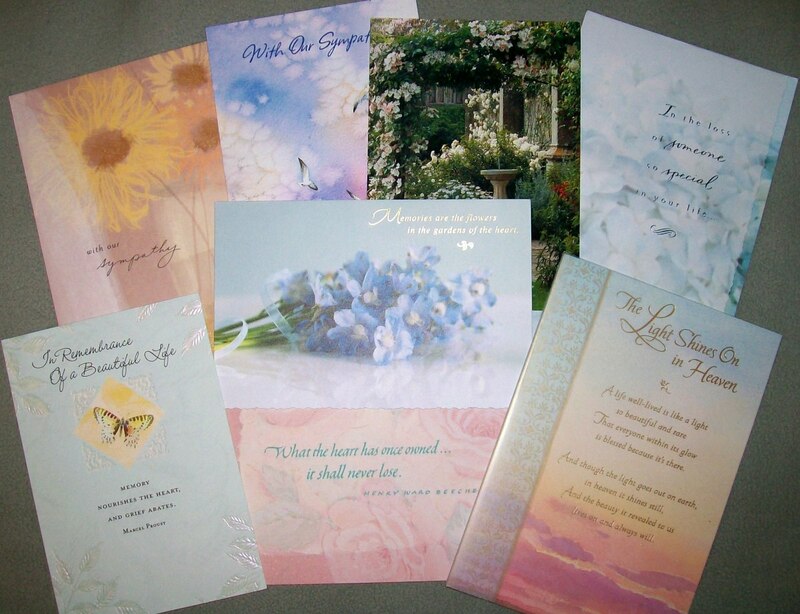 Grief is an overwhelming response to loss. Unfortunately, grief does not go away while a grieving person goes to work. Grieving a loss can affect a person's work. Bereavement leave is the time one has off from work to deal with the immediate issues surrounding the death of a love one. Sometimes it is paid, sometimes it is not. Be watching for an extended book version of Grief in the Workplace written by Dr. Dyer based on the chapter "Loss and the Workplace: What to Do at Work When the World Crashes in Around You." This book will be longer with more more in-depth information aimed at helping employees, managers and employers cope with grief in the workplace. Email Dr. Dyer for updates. Send a message to comfortdoc -at- workplacegrief.org (Replace the -at- with @). In "Dealing with Death and Grief in the Workplace," Kirsti A. Dyer discusses how to handle the feelings associated with loss-not only a loss of your own, but one of someone that you work with. While some bosses show abundant compassion when employees experience the death of a loved one, many others are left with not enough time off to properly grieve. People never forget and never forgive if they think a person has not been respectful of death. That in the long run can be damaging in productivity and morale for a whole work group. With so many ways that people can experience a loss it is not uncommon for a co-worker or a manager to experience some kind of loss whether it is the death of a loved one, the break-up of a relationship or the diagnosis of a life-threatening disease. 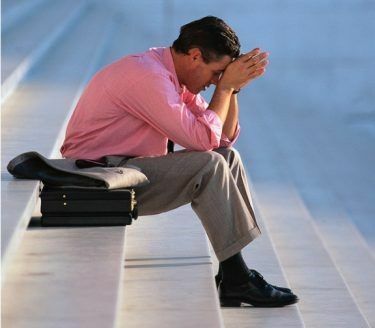 It is important for co-workers and managers alike to acknowledge when a loss has occurred on a personal level and on a professional level as well. The grieving person will remember long after the loss how friends, family, co-workers and managers how a loss was handled. As noted by Carol Hoffman not being respectful of a death can lead to damage in the workplace. Simply acknowledging the loss can provide the grieving person with some comfort in knowing that their loss has been recognized. Recognizing a co-worker or employee has experienced a loss may also help to bring out in the open something that may affect their work performance for some time. Image: Marcin Wichary. Flowers. Creative Commons. 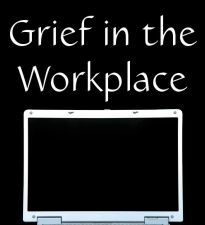 A collection of other resources on Grief and the Workplace selected from the Internet. A listing of resources from NOAH Health on Grief in the Workplace. This web article is designed to provide information on how grief affects three audiences: those experiencing a loss, those working with someone experiencing grief, and those managing someone experiencing grief. Grief affects all of us at different times and places in our lives. The workplace is not untouched by grief. Grief in the workplace occurs when you or a co-worker has experienced a personal loss or a workplace loss such as a death. When a coworker is experiencing grief due to the loss of a loved one, it can be hard to approach him or her to express your condolences. Read our simple guide to showing your sympathy in the workplace. An Interview on Managing Grief in the workplace with David Russo by Brenda Paik Sunoo. Monday, morning. I was down. As they say, "Rainy days and Mondays always get me down." But this Monday was particularly despairing. An article from the Compassionate Friends in Canada. This site answers some of the common questions asked by people who have lost someone in a workplace death. 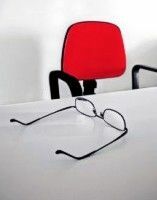 Wellergize Workplace Wellness / Health Promotion blog takes a look at dealing with the stresses of co-worker loss. As much as 33 per cent of workers in Britain say they are offended by language used in work e-mails. Grief at Work articles from the American Hospice Foundation. Many of our articles are provided in .pdf format. To open these documents, you will need Adobe Reader. Grief and Loss expert Dr. Alan Wolfelt wrote this book with 100 practical ideas you can follow after your workplace is touched by loss. Wolfelt looks at the different kinds of grief workers can experience--death, divorce and layoffs. 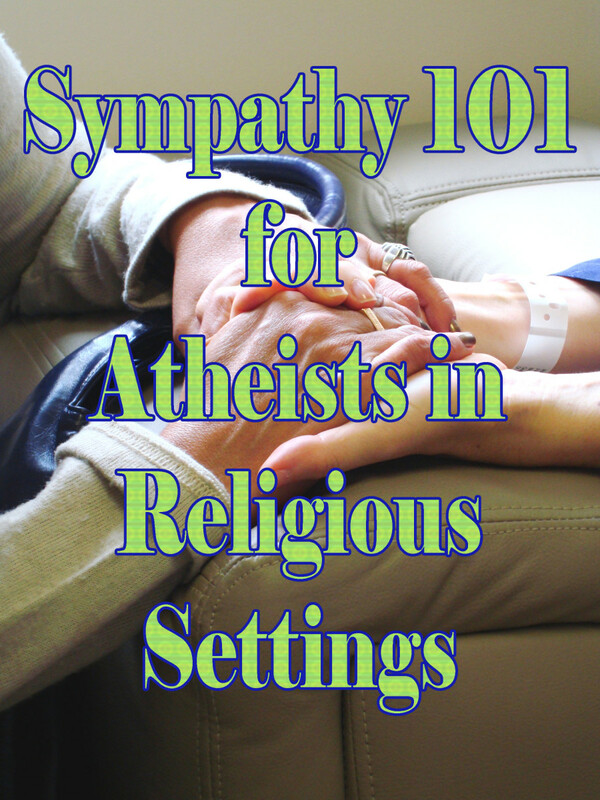 He offers effective ways to channel grief during the workday, how to support coworkers who mourn, participation in group memorials, and negotiating appropriate bereavement leave. 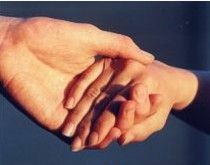 Being supportive of a co-worker or employee who is grieving a loss can be very helpful for the grieving person. Knowing friends, family, co-workers and employers are thinking of them and wishing them support can provide comfort to someone grieving a loss. Here are some suggestions of ways to help a grieving co-worker. Let the co-worker know you empathize with their loss--in person or in writing. Respect the grieving person's desire for privacy. Remember to include the co-worker in any social plans. Let your co-worker decide whether to accept or decline the invitation. Accept less than their best performance from your co-worker for a while, but expect them to return to their best over time. Image: Laura Glover. Holding Hands. Royalty Free Use. The following list are just some ways that you can send your condolences to colleagues or show your support when they are grieving a loss. Note: Not all of these suggestions are appropriate in every situation. Much depends on the circumstances of the loss and your relationship with your grieving colleague. Consider sending a Text or IM message - only if this is how you communicate normally with your colleague. Make a Donation to their favorite charity. Email is one of the ways that people use to communicate with each other daily. However there are some situations where email is not appropriate, like sending condolences. Can I Send My Condolences by Text, IM or Email? Instant messages are used by many people to communicate with each other. However experts feel that text messages should not be used at all with more serious topics. With all of the modern technology there are many ways that messages can now be sent from email to texting. Not all of these are recommended for sending condolence. Text messages are one way routinely used by many to communicate with each other. However, experts feel that text messages should not be used for more serious topics. In addition to being one of the hottest social media tools, Twitter is becoming a medium for announcing deaths and sending sympathies and condolences.This lens started as a way to look at sending ones condolences and sympathies on Twitter. In this book Loss, Grief, and Trauma in the Workplace author Neil Thompson offers a basic understanding of how loss, grief, and trauma affect people in the workplace. Thompson offers advice so that executives, managers, human resource professionals, and employee assistance staff may be able to more effectively help their grieving employees to cope with life's losses. Over the course of a few hours the tweets went from people wishing her well and hoping she would have a chance to marry her long-time companion Ryan O'Neal to news of her death at 9:28 AM. This lecture was prepared and given at the First Annual Perinatal Conference held by the March of Dimes Valley Division in Modesto California in November 2005. The email "gift" came from the staff of the Academy of American Poets with links to a collection of poems specially selected for Times of Turmoil. Bereavement leave or funeral leave is the time off given to an employee by his or her employer to settle all of the matters and issues surrounding the funeral and reading of the will. The time span ranges from a few days to a few weeks, in the best of circumstances. Bereavement leave may be granted by an employer with or without pay. More information on Bereavement from a Suite101.com article. According to a 2006 article in the Japan Times, one company in Japan (Hime & Company) offers their employees the option of taking shitsuren kyuka or heartache leave, "compassionate leave to fix a broken heart" or "a [paid] holiday you take when that happens and you feel too devastated to come to the office." Company CEO Miki Hiradate began offering shitsuren kyuka at the suggestion of her young female employees, who suggested this type of benefit when asked what they wanted from a female-friendly company. Perhaps companies in the United States should consider offering shitsuren kyuka or paid Grief Leave. In the United States, bereavement leave is often limited to a few days and is not a required paid benefit. Maybe grief or bereavement will eventually become a paid benefit as an updated version of "The Family and Medical Leave Act of 1993." Another option for grieving employees who can't get time off from work, is to take a brief Grief Break on the job. A grief break can be a simple as taking a few moments to go to the restroom and giving yourself a few minutes to let the tears (or the screams) out before returning to work. A grief break might also be taking a few minutes to get away from work and grab lunch, go walk in a near by park or go to the gym for a workout. A grief break is designed to get the grieving person time to remember his or her loss and then come back to on focus on work and the task at hand. Source: Hani Y. 2006. Heartbreak heaven for staff. The Japan Times. Image: Red Chair. Royalty Free Use. as if there were no such old thing. We all know that as the seasons change the cold winter melts into spring. 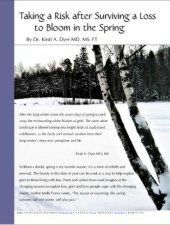 This analogy of winter melting into spring is a good one for people grieving a loss. Over time, the grieving person realizes that he will survive the loss and begins to start living again, as the grief begins to melt away. The grieving person eventually becomes aware that life goes on and begins to take steps back into the world and live again. As the grieving person learns how to integrate the loss, the winter of their grief gives way to a spring of rebirth and living a new life. Source: Dyer K. 2009. Taking a Risk to Bloom in the Spring. Grief, Loss & Bereavement Edublog. You can download the full inspiring article on Taking a Risk to Bloom in the Spring as a PDF File from Docstoc. The benefits of workplace wellness programs have been documented in numerous studies. More businesses and managers are realizing these benefits and developing health promotion or workplace wellness plans for their employees. Research studies are also demonstrating a high return on investment (ROI) for businesses investing in programs to improve employee health and wellness. Financial and other benefits of implementing a Corporate / Employee / Workplace Wellness Programs for Canadian business. Workplace wellness programs encourage employees to take steps to prevent health conditions, eliminate unhealthy behaviors, promote healthy lifestyles. A new survey by Buck Consultants shows that while wellness programs are still most popular in North America, they are becoming more prevalent globally. The buzz around worksite wellness programs continues to grow - and with good reason. More and more employers are looking to incorporate health promotion and disease prevention into their business strategy and culture. Have you ever had to cope with grief in your workplace setting? I know a lot of people who almost lost it because of work stress especially if they have difficult co-workers to deal with. One time, my friend was so pissed off at a co-worker that she sent him an anonymous email saying all the nasty stuff that's been on her head for a long time. She was relieved after that. I went into work one day to be told that a friend and colleague, who had been very supportive of me during a difficult time in my life, had been killed in a freak accident while on holiday. It was a horrible shock and I felt the whole situation was not handled very well, considering what a large orgainsation I worked for. There seemed to be no process for dealing with the situation and it was made worse by the fact that my friends telephone calls had been diverted to me while he was away. I wish I'd had these resources a few years ago when a person on my team was diagnosed with melanoma. It was hard for everyone, but particularly difficult for me as a manager because I had to be sensitive to the team's needs while still trying to maintain productivity. Our coworker, who was only 23 at the time, died within the same year she was diagnosed. It was devastating for all of us, but we're lucky we worked at a company that was supportive. Wonderful Lens covering a difficult subject, I have had to cope with Grief once. Blessed by a Squid Angel.